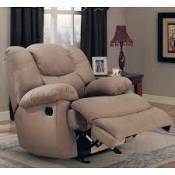 Item Number : 10652Feature : BWN PU RECLINER W/LIFT,MASSAGEDimens.. Merging a decidedly clean profile with cozy comfort, the Alenya rocker recl..
There’s no shame in sacking out and kicking back, not when you look as good.. Inches: 42” W x 42” D x 41” HColors:GrayStyle:Contemporary..
How beautifully the Samir power lift recliner elevates your level of comfor.. The Boyband power recliner is a delightful departure from the mundane with ..
Movie nights will be forever changed with the Composer power recliner. The ..
Take charge of your seating with the Ballister power lift recliner. Its eas..
Dimensions (Confirmed):Inches: 36" W x 37" D x 43" HMetric: 914.4mm W x 939..
With a 360-degree turning radius, Bronwyn recliner takes a cool spin on con..
With plush cushions and angled pillow top arms, the Tambo rocker recliner t..
Dimensions (Confirmed):Inches: 41" W x 41" D x 41" HMetric: 1041.4mm W x 10..
Those who choose timeless over trendy can take comfort in the Nadior reclin..
Dimensions (Confirmed):Inches: 43" W x 41" D x 42" HMetric: 1092.2mm W x 10.. Inches: 39” W x 41” D x 41” HColors:BarkStyle:Contemporary..
Rock the cool look of leather minus the hefty price tag with the Boxberg ro..
Dimensions (Confirmed):Inches: 40" W x 43" D x 43" HMetric: 1016mm W x 1092.. Inches: 39” W x 40” D x 40” HMore Dimensions:Seat depth 22.00"Seat hei.. The calming taupe color lures you to curl up inside the Nimmons power recli.. Calming taupe color lures you to curl up inside the Nimmons zero wall recli..
Dreamy midnight blue seduces you to curl up inside the Nimmons power reclin..
Dreamy midnight blue seduces you to curl up inside the Nimmons zero wall re..
Delectable chocolate color tempts you to curl up inside the Nimmons power r..
Delectable chocolate color tempts you to curl up inside the Nimmons zero wa..
Dimensions (Confirmed):Inches: 57" W x 39" D x 40" HMetric: 1447.8mm W x 99..
Want the coziness of a recliner but not the large scale? Say hello to the C..
Dimensions (Confirmed):Inches: 38.5" W x 36.5" D x 43.5" HMetric: 977.9mm W.. Looking for a peaceful retreat? The Minturn power recliner is at your servi..